When you think of small evergreen shrubs, do you have an image in your mind of small, rather uninteresting lumps of green dotting a landscape? Well, you shouldn’t. There are plenty of lush bushes that are quite colorful. It is just a matter of knowing which grow best in the mountains of Arizona. Here is my list of short, showy shrubs with ample color that will enhance your home with unique evergreen colors. We carry all of them at the garden center, but I also have attached a link to buy them online. From Top Indian Hawthorne – Left Silver Berry. Blue Star Juniper – This is strictly a foliage plant. If you like the look of a blue spruce tree but lack the space for something that big, merely scale down and grow a Blue Star Juniper. With its short blue needles it looks especially good when planted next to shrubs with golden foliage. Dwarf English Boxwood – A small, rounded evergreen shrub which, if left unpruned, forms tufts of growth resembling clouds. This slow-growing dwarf form is ideal for edging borders along pathways or around flower beds. Well-suited for topiary and containers. Considered to be the most resistant to the boxwood leaf miner. Eichholz Cotoneaster –A very low-growing, wide-spreading ground cover with highly ornamental berries. Glossy, bright green leaves provide rich autumn color as they turn from gold to orange-red. Small white spring flowers develop into showy red fruit in fall. Euonymus ‘Emerald ‘N’ Gold’ – An evergreen bush, it exhibits some sort of variegation in its leaves. The name describes its bicolored leaves pretty well: They are, indeed, emerald (at the center) and gold (at the margins). Indian Hawthorn – Another Euonymus, this easy-to-grow evergreen shrub produces huge clusters of fragrant, pearl-pink flowers. Perfect for planting along driveways and parking medians where reflected heat is an issue for many other plants. This spring-blooming evergreen loves Arizona heat! Gilt Edge Silverberry – A splendid Arizona native, this euonymus sports a combination of golden-yellow margins on bright green foliage that provides wonderful year-round landscape interest. It’s superb as a hedge or low screen that tolerates heat and wind, and requires little maintenance. Tiny, fragrant, silvery fall flowers are followed by ornamental red fruit. Mugho Pine – With its dense, symmetrical growth and compact, rounded form this dwarf pine is perfect for confined spaces. Blue-green spring and summer foliage takes on a golden hue during colder months. Its slow growth habit makes this evergreen ideal as a specimen in smaller gardens, or massed to make a bold statement in larger landscapes. Yucca – Massed together, yuccas form an impressive display during their blooming period. But the types with golden foliage (such as ‘Garland’s Gold’ and ‘Golden Sword’) are good choices if you want something colorful, because they provide bright color even when not in bloom. 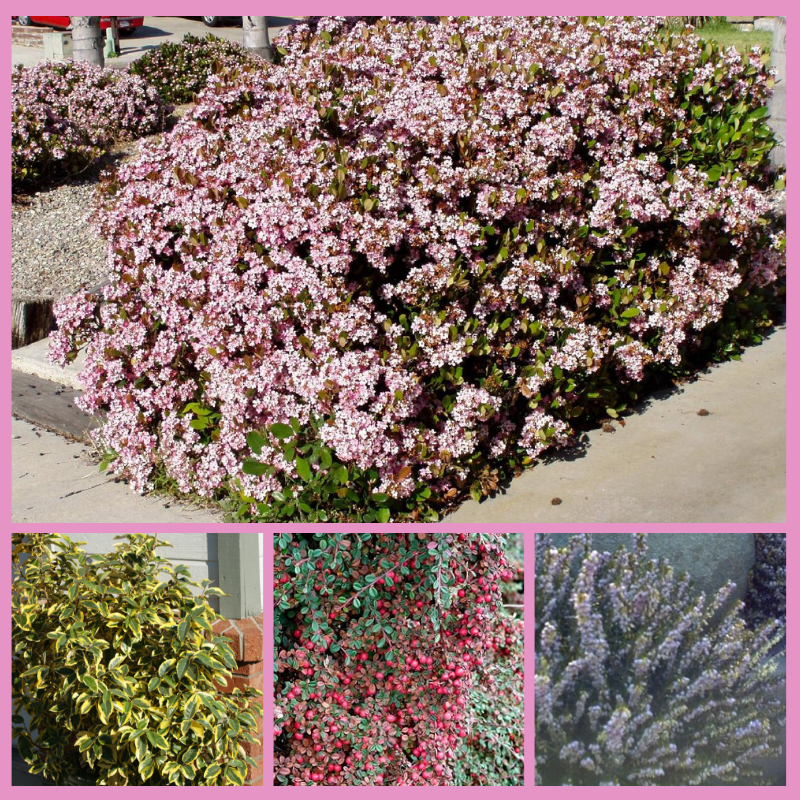 Winter Heaths – Many first-time growers of these small evergreen shrubs become quickly impressed with them because of their long blooming period. Winter heaths (Erica x darleyensis) live up to their name, putting out flowers in that most unlikely of seasons: Winter. If the climate and conditions are right for them, they may end up flowering for about half the year. will rabbits chew on Euonymus? Euonymus is not on our list of rabbit resistant plants.